“Your surf board bends more than you do,” said my instructor as I was dumped once more at the beach. I’d been dragged along by the leash on my ankle that connected me to the board that was doing just fine — better, in fact — without me. Undaunted, I, the greenest new boy in Costa Rica, rose to try again. As the forties approach and child-rearing becomes less intense, we often find ourselves with that most elusive commodity on our hands – time. So, if the latest series of The Walking Dead saga fails to absorb the extra hours, what should we do to avoid twiddling our thumbs? With an increasingly independent teenager myself, and having had my surfeit of cinematic zombies, it was a case of dipping far more than my toes in the water — trying something that I’d always had an interest in, but life’s circumstances had prevented me from taking up. I’d always enjoyed swimming and being by or in in the sea, so the idea of trying to master being on it now appealed. There are lots of activities you could take up ­– para-gliding, pot-holing or any of the other equally worthy challenges – but should you choose surfing and announce your intention to family and friends, once the howls of laughter die down what do you do next? In the box below is what I didn’t do, but wished I had. The thing that I did right was I didn’t try DIY. I took classes. Brush up on your front crawl swimming lengths of the pool using only your arms for sustained periods. This will help get your muscles ready for the rowing action you take as you catch the wave. Yoga is great as it greatly increases your flexibility. In particular, you need to be able to arc your back while rowing on your board without feeling any pain. Pack waterproof sunblock and drink lots of water in addition to the gallons of sea water that you will find yourself unwittingly swallowing. Have patience – it’s hard. One really fun part of the process is deciding on where you want to surf. My home town in England, Crewe has lots of trains, but the only waves are of the Mexican type at the football ground. So, assuming you also aren’t living with a surf beach in your backyard and don’t wish to lose contact with your delicate regions while shivering away inside a thick wet suit, you can always ‘surf’ the internet for some inspiring possibilities out there. Surfer Today and Surfing Waves are just two of a number of websites with reviews of surfing locations. Here are my own suggestions based on the great locations, cultures and food, as well as the surf. I prefer far flung places with plenty of sun – so please excuse my complete subjectivity. Thailand has two places on the Indian Ocean that are great for beginners – Phuket and Koh Lanta. The first is famous as a wild party place, the second a less well-known quiet hideaway. Bali in Indonesia has many surfing beaches and Byron Bay in Australia is hugely popular for first timers. In Latin America two places leap out. 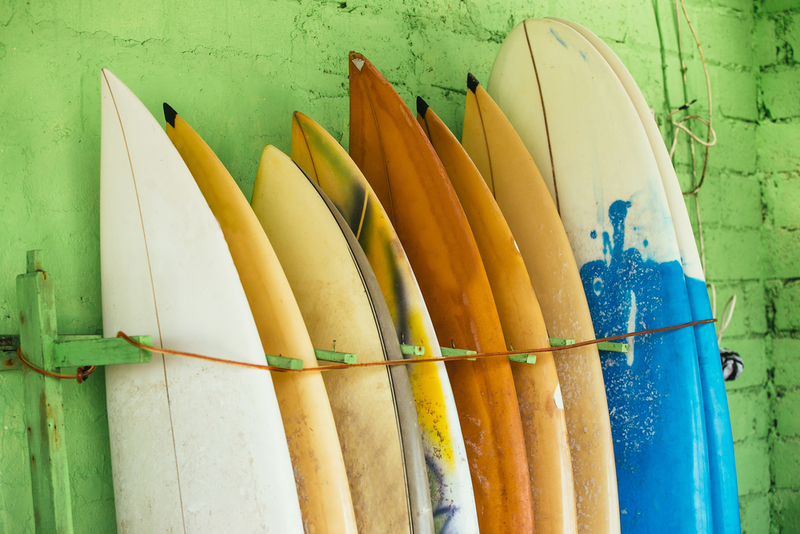 Costa Rica is full of surfing beaches, though more on the Pacific side. Those with the necessary infrastructure to offer classes include Tamarindo, Santa Teresa, Jaco and Playitas. That gives the intriguing possibility of moving around this small country and visiting different beaches. The other is one of the most beautiful and exhilarating cities in the world, Rio de Janeiro, which has surfing beaches right in the city, though that means they can get busy. More peaceful would be a few miles down the coast in the suburb of Barra de Tijuca. There are all sorts of interesting surfing locations as a quick search of surfing websites will reveal. Initially head for the reasonably well established ones with surfing schools that offer a range of board sizes and instruction. Unless you fancy yourself as the aquatic version of Eddie the Eagle there is one other must for your travel plans. Choose beaches with a sandy bottom, no sharp coral or rocks. Wet sand is so forgiving. When you get your first board it will seem so big, something akin to a flat landing craft. As your prowess grows, your board should decline in size, until, like me, you can pack it up and throw it on the back of a landing craft transporter ship. 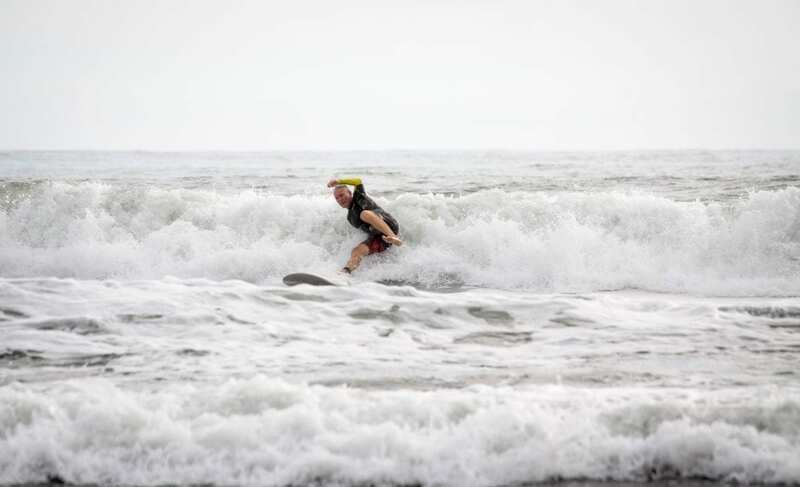 Learning to surf requires preparation, training and a little expense, but if you do decide to take up surfing in your forties, you will feel an intense sense of achievement as you inch forward from success to success and master new skills. As for me, I heeded my instructor’s advice, got stretching and never looked back. With the pleasure of discovering a new location as you learn to surf the benefits multiply. And in the longer term, if this becomes more than a week of adventure, you will tone up your body, become more flexible and get fitter. As you come home, surfing trophies in hand, just think of the anecdotes you’ll be telling.